The classic expression of Arran, the fresh and unique island style is captured beautifully in this 10 Year Old Single Malt. First released in 2006, this is the flagship Single Malt of the distillery. It is without doubt a 'must have' in the collection of all Single Malt Whisky enthusiasts. 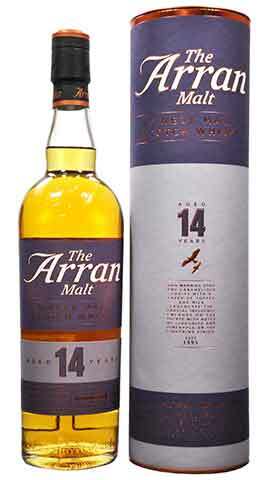 The Arran 14 year old is the most popular malt of their core range of whisky. It is a perfectly balanced marriage of both first fill Sherry and Bourbon casks. 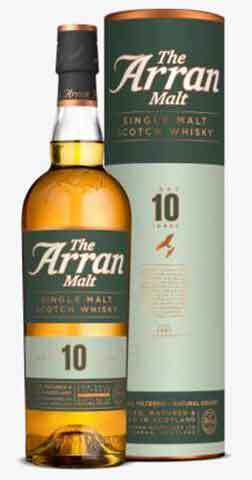 It captures perfectly all the fresh character of the Arran 10 year-old with an added layer of intensity and fruitiness. An extremely popular Cask Finish, The Arran Malt Finished in a Port Cask is non chillfiltered and bottled at 50% for a richly rewarding and fruity whisky. One to be savoured. After initially maturing in traditional oak casks over a number of years, The Arran Single Malt in this bottling, was finished in a selection of Port wine casks sourced from an artisan producer of this iconic Portuguese fortified wine. The Master Distiller, James MacTaggart, has carefully monitored this period of secondary maturation to ensure the perfect balance is struck between the Port casks and the intrinsic sweet-fruity character of The Arran Malt. The end result is a Single Malt full of charm, complexity and quality. 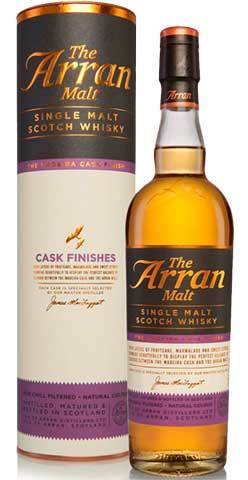 With the Arran Cask Finishes, they transfer the whisky from traditional oak casks and finish it for a period in some more unusual casks to add a different twist to the classic Arran taste profile. The current range comprises of Amarone (fullbodied red wine from Italy), Port (fortified Portuguese wine) and Sauternes (sweet white wine from Bordeaux) with all of the casks sourced from traditional producers of these iconic wines. Bottled at 50% for greater depth of aroma and flavour. 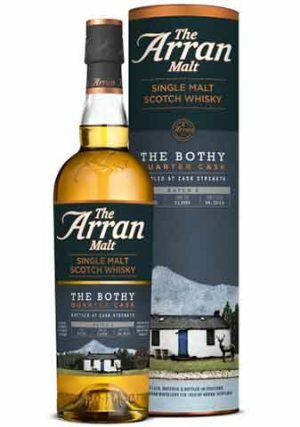 The Arran Single Malt selected for The Bothy was initially matured in first-fill ex-Bourbon barrels before being transferred for secondary maturation into smaller casks also made of the finest American oak. This process produces far greater contact between the whisky & oak and a faster, more intense maturation. The end result is a full-bodied expression of The Arran Malt combining power and finesse full of rich vanilla sweetness and bold peppery spice. Bottled at natural Cask Strength of 55.2% without chill-filtration or artificial colouring. 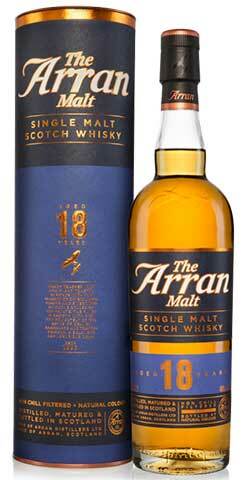 This release of The Arran Malt at 18 years old has been produced from un-peated malted barley, and was matured in a balanced mix of aged ex-Sherry and ex-Bourbon casks. The whisky has not been artificially coloured and has not been chill-filtered at bottling thus retaining the full range of aromas and flavours which typify this unique Island Single Malt. Bottled at 46% abv. After initially maturing in traditional oak casks over a number of years This Arran Single Malt was ‘finished’ in a selection of Madeira wine casks sourced from an artisan producer of this fortified wine from the island of Madeira some 800km south-west of Portugal. Master Distiller, James MacTaggart, has carefully monitored this period of secondary maturation to ensure the perfect balance is struck between the Madeira casks and the intrinsic sweet-fruity character of The Arran Malt. 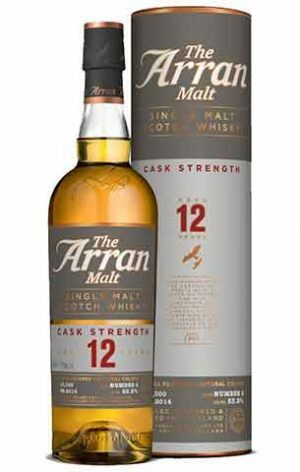 "rich brooding character, full of complexity and quality"
A special limited edition batch release of The Arran Malt 12 year old at Cask Strength. Currently Batch 6 at 52.4% abv. Non chill-filtered and no artificial colouring. A combination of first and second fill sherry hogsheads carefully managed by master Distiller James MacTaggart.